With this CleanFreak Carpet Extraction Cleaner, you get a fool proof carpet cleaning solution. It can be used in any of our self-contained carpet scrubbers, carpet spotters, or box extractors without worry. The low pH (between 3.0 - 6.0) makes it powerful enough to clean mildly soiled carpets, yet it's gentle enough on the carpet fibers to safely be applied on any type of carpeting. This being said, we still recommend testing an inconspicuous area for color fastness, before cleaning entire areas. We recommend mixing this carpet extractor cleaning solution at 2 ounces of chemical per 1 gallon of water for normal extraction duties. It can also be used to scrub carpets with a bonnet, where you would want to mix it at 12 to 16 ounces per gallon of water. And, finally if using it for pre-treatment of carpets, you'll want to mix 16 to 24 ounces per gallon of water. For complete instructions on how to bonnet scrub a carpet, or how to properly extract a carpet, please take a look at our resource center. If you're dealing with extremely soiled areas, you may want to look at something like our carpet & upholstery cleaner, which has a much higher pH of 11.5. Both of these products, plus more can be found in our extractor shampoo solutions category. Customers who were interested in the CleanFreak® Carpet Extraction Cleaning Solution - 2 Gallons were also interested in the following items. I use this product for commercial carpet cleaning. It cleans well, the ph is neutral, which is safe for most carpets and it doesn’t have a strong chemical smell. 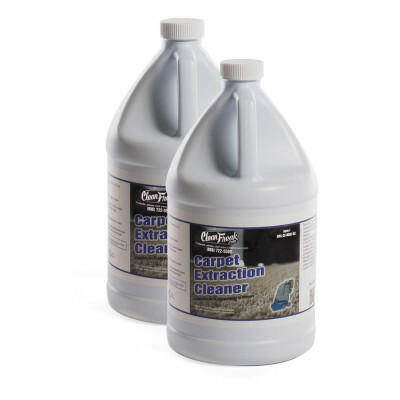 This is a review for the CleanFreak® Carpet Extraction Cleaning Solution - 2 Gallons.